No matter who the Labour Party Coven selects to fight Key in 2014 - Mr Likable or Mr Ready Now, the first act of leadership would be for the new Labour Party leader to turn down the convention that see's the Opposition stand down an MP to allow the Government to elect it's Speaker. They could argue that the controversial legislation that National wish to ram through should be scrutinized to the highest level and only an Opposition Speaker could ensure that level of scrutiny. If Labour refused to pull out an MP, National would be forced to lose their majority if they selected Lockwood meaning the Maori Party would be kingmaker in any legislation meaning Asset Sales couldn't pass. 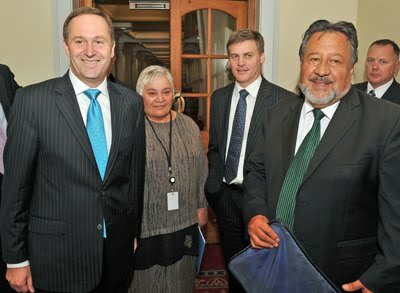 Instead of that outcome, National agree to an Opposition Speaker, either Trevor Mallard or Dr Pita Sharples. So the question to ask to evaluate if this idea would be worthwhile is, how much does Labour oppose State Assets? Huh? Doesnt the speaker get a vote (usually cast by the whip except for conscious votes)? National still has the numbers with Act and UF. If Lockwood is speaker, he still votes with the Nats. And besides, the role of the speaker is to enforce standing orders, not policy. Fatal error, Bomber. Following the introduction of MMP, Standing Orders were changed, and the Speaker now gets to vote like every other MP. The party strength of the party the Speaker comes from doesn't fall by a vote, like they used to in FPP Parliaments. The Speaker's casting vote is also gone, replaced with a standing order that says a tie vote is a loss. I don't think you have reflected the reality of the situation when it comes to the Speakers vote under MMP. From what I have read the Speaker gets to vote and so a National Party speaker would not cause the National led Government to lose their majority. Wow, that really was a "Back to the 80's" moment! I'm picking that the Maori Party will be gone after 2014; following Mana Motuhake and Mauri Pacific. The MP vote probably go to Mana, which will also 'soak' up ex-Alliance votes as well. Graeme Edgeler said... " Fatal error, Bomber. Following the introduction of MMP, Standing Orders were changed, and the Speaker now gets to vote like every other MP.